Christnology: Answering a Deist: Why do bad things happen to good people? I stumbled across a very vocal and seemingly respectable deist on the interwebs the other day, calling himself Tracks. He has created a WordPress blog for himself where he poses some good, honest questions to various religions, one of which of course is Christianity. Now I don't consider myself a Biblical scholar by any means whatsoever, but I enjoy comparative theology and Biblical debates as long as they are on honest and respectable grounds. This is mostly because it pushes me towards learning more about religion in general, especially my own. Tracks has posted several questions on his Discussion on Christianity page and, while there are certainly answers to all of his questions, I will attempt to discuss only those conducive to online discussion. Some of the questions posed, although popular amongst Christians and nonchristians alike are simply fire starters to heated debates that end up getting nobody anywhere. But we'll see how this first one goes and we'll proceed from there. I also don't plan on changing anyone's mind here, please understand that. I am simply looking for some healthy discussion. After all, I sincerely doubt my crude ramblings would sway anyone, never mind a self proclaimed "old fart and deist of 52 years." Please, if you notice any mistakes in my answers or if you have alternative answers (or questions) yourself, by all means post them in the comments below. I only ask that you stay honest and, most importantly, respectable. Thank you. I have a question for any Christian which cares to answer it. It concerns Mark 16: 15-18. You know the contract between Jesus and “his followers”. If his followers are who they claim to be then why do we still have hospitals? Why do they not heal the ill, the terminally ill, Why can they not perform the signs of his followers as promised by Jesus? This question stems from the age-old "Why do bad things happen to good people?" That is, of course, a very popular question among skeptics and believers alike. The answer, however, seems to be simple enough: the existence of pain, suffering and cruelty in this world is a direct side effect of our God-given free will. Of course, God has the power to prevent all evil from happening, but chooses not to so that our free will can exist. Man's will overrides God's will on Earth because God allows it to. If God were to decide what actions we take, whether we are to do good or bad deeds, then we are as remarkable as robots. Love suddenly loses its flavor and the meaning of life rendered irrelevant. It is the choice -- the free will -- given to us that breathes life and meaning into love and in turn, life. Unfortunately, because of this choice that we are accorded, you see the suffering around you. Why that suffering is so apparent and seems to eclipse the otherwise good that does indeed exist is the same reason why you only hear about bad news; it is what is most "interesting" and thus what garners more attention. This is also why you don't really hear about miracles. As you asked, "if his follows are who they claim to be ... " why don't we hear about miracles (healing the stick, etc). There are many reasons for this, one of which goes along the same lines as bad news is the only news that really gets reported. That doesn't mean miracles don't happen, for they certainly do, however, because of skepticism and political reasons many of these miracles aren't seen as miracles -- there will always be ways of explaining them scientifically, or even mathematically but does that necessarily mean that they aren't miracles? In that regard, it is up to each person individually whether to categorize the occurrence as a miracle or not. By that token, we delve into the discussion of what a miracle is and what defines a miracle; that is a whole separate post by itself. If you ask me, the mere fact that you and I are still living and breathing for this many years beyond birth despite all that is around us is a miracle in its own right. Fair enough, in the simplest terms this answers persecution, burglary, murder, etc, but what about illnesses and natural disasters? At first, I was a little perplexed by this myself, but with a little research a surprisingly simple answer presented itself. Remarkably, it is answered in a likewise manner. The physical world around us has its own sort of free will -- natural law. The natural law exists to establish physical properties; it allows animals, plants and even ourselves to live and thrive in this world. They exist in a constant, unchanging perpetual state without exception. The very fire that we use to kill bacteria in our food so that it is edible is the same fire that can destroy forests and houses. The same hot and cold air that heralds the changing of seasons around us also creates tornadoes and hurricanes. Rain water that allows plants and trees to grow and animals to drink is also responsible for flooding and destruction of villages (AP). But why doesn't God prevent the bad natural disasters from happening and permit the good natural occurrences? Suspending the natural law intermittently would actually end up destroying the world around us, making it impossible to live (not only ourselves but the life around us). If the natural laws were to only be occasionally observed, then they would essentially never be observable. We could not realistically expect anything to happen with any real level of certainty and the Lord's hand would be required to act ever increasingly: not only to save us from natural disasters, but to also save us from "unnatural" occurrences -- a manufactured salvation that was unnecessary in the first place. ApologeticsPress.org has some great articles about this exact topic (and others that you have questioned) here and here (pg. 7-20). The answers to your questions are out there, it simply requires an open mind and a true desire to learn more. 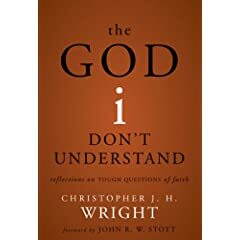 Interestingly enough, as I was doing a bit of research on this and other topics I stumbled across a very intriguing book, The God I Don't Understand: Reflections on Tough Questions of Faith by Christopher J.H. Wright. It seems like it could be a great read, so I've queued it up for some summer reading. I'll try and post a reaction here when I can. My problem with the free will argument is that it assumes that in order for there to be good things, there must be bad things. Is that really so? We think it's so because that's what we have told ourselves. But God created everything, right? And He could set the world up in any way he chose. He could have set it up that humans are incapable of doing evil things. He could have set it up so that evil things do not even EXIST. That would not make us robots because we still have the choice to love God or not. What is the point of children and babies being molested, starved, beaten, abused, etc. If humans were made incapable of doing such things to children, how would that be turning us into robots? According to the Bible and most Christians, God can intervene and help people, save people, etc. So when a 5 month old baby is raped, where was God? What did the baby do to deserve that? Original Sin? Why would God set it up like that when he didn't have to? I'm not sure if I'm explaining myself very well. I just feel that one of these 3 things must be true: God is loving but not all-powerful, and that's why the baby is raped; God is all-powerful, but He doesn't care and is unfair, and that's why the baby is raped; or there is no God. First of all, thank you very much for taking the time to reply; it is much appreciated. I love to hear from visitors. Now when you say that God could have set the world up so that we are incapable of doing evil, that implies that we are given free will *to an extent*. We are therefore, given free will up until the point that we are doing something against the Will of God (for the Will of God is always good). Then, the word "free" in this modified "free will" is rendered useless. We are not truly "free" to do anything then, are we? Realize also that God did not create evil. Evil is wholly attributed to man's decisions. Evil is the absence of God (the absence of good). If he made it so that evil did not exist, then he would have had to make it so that we have no choice but to do everything that God commands and that God wills. This is not free will and by this limitation it is impossible to truly love. We are at that point constricted to the "rails" that God creates for us and are on a predetermined path to "love" God. "Love" being there in quotes because it is, of course, not true love. We are then indeed robots because to not love God is to do evil and to love God is to express our true love by practicing our God-given free will in a manner pleasing to him.